Kate Hackett's ceramics. Robin mugs £12; robin plate £28; Jenny Stacy fairies £10 each. Finding a special gift for the people you love can be challenging. As I get older I get more and more fussy (discerning is a polite word for it!) I want to find something that is just right. Something that expresses my love for them and tells them I have been listening. I know that this is a gift they will appreciate. In my family we do stockings for each other and so there are little special gifts to find to put into those too. And by special I do not mean expensive. I used to think that the ideal is to make everything you give. Some people achieve this and I take my hat off to them. But for most people there's no time for that. We have to rely on what's in the shops or online. I think Handmade Happiness has some very special gifts. Handmade but not, for the most part, expensive. And selected by someone who is very fussy/ discerning - me! Brenda Tilbury is always on the lookout for interesting seedheads, lichen, berries and fir cones as she walks her dog. She makes these into the lovely, natural wreaths you see pictured. These should, she says, last forever as long as they are not crushed. I am delighted to offer Brenda's work for sale in Handmade Happiness. And in the last week all four of Brenda's wreath's - all that I had - sold. This included a Christmas wreath which smelled divine due to cloves, cinnamon bark and star anise mixed in with the local foliage. I look forward to having more of those soon. Now I have another incentive to walk in the early mornings. 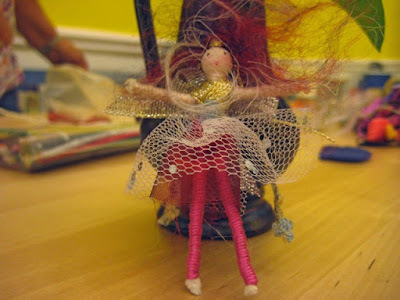 I'd like to find some interesting bits for Brenda and then there's feathers... Another maker needs feathers. What are they making with feathers? Check back soon to find out. Needlefelted piece by Jenny Stacy. I just heard about a book called 'The Life-Changing Magic of Tidying' by Marie Kondo. She advises holding each one of your possessions and asking yourself if it brings you joy. If it doesn't you can get rid of it. I admire this idea but realistically I could never put it into practice. My generation is too heavily influenced by the 'waste not, want not' school of thought. I admire Marie but I also admire women who made rag rugs out of clothes too worn through to wear any more and who can make a whole week of meals out of one chicken. I'd like to be more like Marie. As she says when you discard things all that is left is things you really treasure. But I suspect that my boxes of 'treasure' - like the tiny scraps of fabric used to needlefelt and the boxes of pretty pictures and scraps of painted papers I use for collage would not be tolerated in her world! I'm always drawn to articles in magazines that advise you to 'de-clutter' and change your life. But so often their idea is buy storage furniture or buy lots of plastic boxes and put things in order. As Marie Kondo says 'this just creates the illusion that the clutter problem has been solved.' I prefer her method of asking yourself what really brings joy into your life.Then you can decide what to chuck and what to save for that rag rug or mixed media project!! I'm experimenting with a smaller doll as I have said I'll have more dolls in the shop by the end of next week. This is a 5 part doll. I start by drawing the shapes on an opened out cereal box - this is why I could never do a kit of my designs! Then I cut out all the pieces twice in fabric and sew them together leaving gaps for arms and legs. The doll you see is not going to be sold. Making her has shown me the faults in the design. Because the stuffing may shift I've decided to sew the tops of legs and arms before attaching them to the body to stop this happening. So hopefully the next doll and dolls following will be more saleworthy. I'll finish this particular doll and give her to my little grandbaby, Juno, who has been staying this week with my daughter. Having Juno in the shop is delightful. She totters around on her 16 month old legs and can be amused for whole minutes at a time puting my handmade buttons into different gift boxes and tipping them out again. Now she has gone home my whole attention is once more focussed on the customer and today, Saturday, promises to be a busy day. Doreen Arnold delivered dozens of the white crochet snowflakes she makes to the shop yesterday. 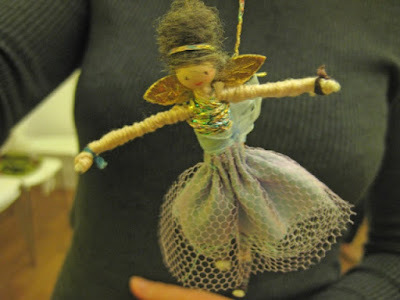 She also brought in some angels which I haven't seen before. With her permission I glittered the angels this morning. Three with white glitter and one with silver glitter - on both sides. What my picture doesn't convey is the way they sparkle with the light catching silver and white. It's been a week of indecision. With this needlefelting I can't decide whether brooches or Christmas decorations would be the best use for these pieces. I can picture them sewn to torn sari silk ribbons at intervals - maybe three ribbons between each with more torn bits hanging down as a lush Christmas garland decoration. Or they could just have loops of sari silk ribbon to hang them from the tree or they could have a brooch back sewn to them. Or they could be sent in a parcel to Bee. I sent Bee Mellor, my Two Birds jewellery collaboratrice, a parcel last week but now I keep seeing other things I wish I'd sent so a second parcel seems bound to follow! As people come in to see what Christmas presents they could buy at Handmade Happiness I am filled with a sense of urgency. But that indecisive mood means I don't know where to focus my making. 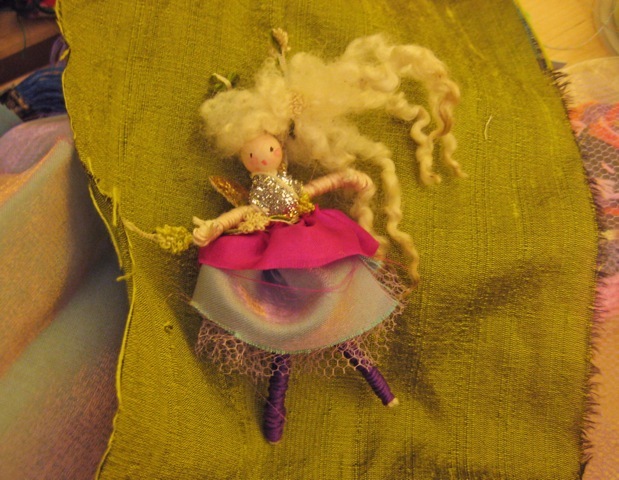 Fairies, yes, I've made some more of them. People would like smaller dolls - I've just drawn a pattern for them. Jewellery because I haven't got enough jewellery and those handmade buttons - I never seem in the mood to make those these days but they do sell well. So FOCUS is my message to self. Is it the time of year? Do any of you also feel indecisive at the moment? My grandbaby and her mum are coming to stay this week which will be lovely. You may meet them if you visit the shop. This week Christmas crept into Handmade Happiness. Kate Hackett brought in her tree decorations (they are all £3) and robin mugs (£12) and a robin serving plate (£28). These decorations can also be tied on to a gift or hung round a bottle. The backs are easy to write on with felt tip. Sue Inglis brought in her latest knitted Christmas designs and special Christmas cards and gift tags. Pictures to come. It's only October so I don't want to go all out for Christmas just yet - it annoys me as much as anyone to see big Christmas displays in supermarkets too early. But you will notice that gradually Handmade Happiness will have a slow build up of Christmas things from now onwards. In the last two weeks I've noticed people are looking for gifts. They know that if they see the perfect thing now they have to buy it because the next time they come in that one-off handmade gift will possibly have been sold to someone else. I'm making every afternoon in the shop right now. For some reason customers tend to come in during the morning. In the afternoon people browse rather than buy. Yesterday was so cold that I had the heater on and a scented candle burning. I'm making decorations and brooches right now. Next on the list is smaller dolls. One of Jill Denton's hooked pictures. Some of the things I came home with are pictured. I was so impressed with the colourful exhuberance of Sue Dove and Jill Denton's exhibition area. Cards and postcards showing their embroidery and rag rug work are shown above. I fell for colour again when I bought this skein of sari silk pieces and I love Liberty fabrics and one stand was selling bags full of assorted scraps. Michala Gyetvai stitches into wool creating energetic pictures with lots of movement. Pictured above are two of her cards. If I had a degree in computer science I could work out what is currently wrong with my emails. They don't send. My email address (which I've had for probably 15 years) is 'not recognised'. Therefore no pictures today. Frustrating, but those of us with no specialised technical knowledge are used to this. I find the whole computer thing boring so I rely on the machine sorting itself out or another human being telling me what to do. Currently I'm being urged to join Instagram but right now it just feels like another thing to go wrong. Talking about joining up, can I take this opportunity to say I ignore anything emailled about Facebook or Linked in. So those friend requests... I realise I seem to be being rude but actually I don't want to belong to Facebook or Linked in. Their emails just clutter up my inbox. In a mad moment because someone I know asked me to I joined but instantly regretted it because those emails keep pinging in several times a day and actually life is too short. I want to do what I enjoy and time is precious. Let's not waste it when we don't have to! Love the movement and energy in Michala Gyvetvai's pieces. Close up of that interesting gold flecked yarn I showed yesterday. Michala Gyvetvai's work reminded me of Van Gogh with those urgent patterns full of energy and movement. Click on her pictures to go to her website. There were other artists whose work I want to share but I didn't feel comfortable taking photos of the young students' work. Amy Tang is one of those whose exploded rose theme was so pretty and delicate. I think we'll hear more of her in the future. My favourite exhibition area was occupied by Sue Dove and Jill Denton. Bright colours, naive pictures in embroidery and using rag rug techniques.Deceptively simple but the impact was strong and just to see it was uplifting. Pictures tomorrow. I came away thinking how important it is to be yourself in your art. Not to make what you think will sell or to be influenced by anyone else but just to do your own thing. No compromise. Be the best 'you' that you can be. And working with passion and energy, sometimes at speed,maybe gives something extra to the finished work. Gold flecked yarns. Love the green/blue on the right. Colourful felt on the Felt Creative stand. My brain is teeming with images of the Knitting and Stitching show. I saw so much talent (more pictures tomorrow). There are three rooms, one with all the traders in selling things to make with, a smaller room with makers and guilds showing their wares and best of all, a vast area showing student work and the work of interesting and well known designers and artists. I bought things and I chatted. I was inspired, shocked, and excited by some of the art. I'll try to explain more tomorrow. Layers - I like the subtlety of printed chiffon over wool bottom right. My favourite - gold over velvet. Pretty old lace, needlefelted into tatters. Yesterday afternoon in the shop I had fun trying out different fabrics and seeing how they needlefelted and needlefelted in layers. Love the idea of gold over red velvet for tree decorations! Thursday night's workshop on making Christmas decorations has been cancelled. Not enough people were interested in doing it to make it worthwhile. So apologies for that. Of course, life being what it is, as soon as I had cancelled it a woman came into the shop asking if there was still space for her and her husband to attend. But to be honest I am very tired right now and will be glad to have a workshop-free week. The shop is now back to being open 5 days a week as my little grandaughter has started at nursery so I no longer need to look after her on Tuesdays. I miss her but my daughter brought her down last week and Juno seems to love being in the shop. I wonder if she'll be able to weave. A teacher told me she tried a weaving activity with her small charges and none of them were able to do it. She reckons they are so used to the up down motion of pushing a button that the more intricate over and under action was alien to them. This reminded me of being on a train recently and seeing a platform full of people with their heads bent down looking at their phones. Will one day babies be born with heads locked in this position? So my cut price finds on Sunday were (pictured) a Neom candle which smells gorgeous and is called 'Happiness.' (I'll burn it in the shop.) Rose and olive oil soaps from France. A lavishly illustrated Italian cook book by Tessa Kiros and a very soft wrap.A bit of international luxury at bargain prices. Ideal! Talking of shopping I needed to get some clothes for my Mum yesterday and I was dismayed by the harsh colours and rough feel of the things I saw. Those blacky-brights don't suit most people so why are they offered? And I'd like soft cottons and machine washable 'superwool' but all I can find is synthetic fabrics. Is it me? Thursday night is Christmas decorations workshop night. I'm puting together a few examples as pictured. The fabric at base is the start of a fabric decoration because some people prefer sewing to cutting and sticking so I hope to have four or five different designs for inspiration. Now I must hurry to the shop. Currently in the window of Handmade Happiness. Details below. Cashmere matinee jacket and cashmere baby bonnets. Fairy by Jenny Stacy £10 riding a sheep made by Sue Inglis. Buttons £1 each and textile bracelet £15 by me; spotty vessel £9.50 by Niloo. Mohair yarn £3.95; Pierced nightlight by Samantha Robertson £14; Mice by Sue Inglis £6.50. White bowl £12 by Justine Jenner; Liberty fabric necklace by Kate Box; Embroidered picture £29.50 by Sheila Barrow. Kate Hackett jug £18; kaleidoscope by Frank Higgins £93; Felt spec holder by Sheila Barrow £15. I just sat down and drew out the designs for next week's workshop on making Christmas decorations. I've had a mental picture of what they would look like and I've been thinking of how, practically this can be achieved within two hours and the answer came to me in the night -use a stapler. I'll do a prototype on Sunday and show you what they'll look like. 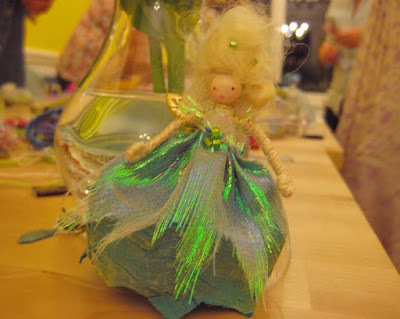 The Christmas fairy workshop was well attended by 11 makers. I did a previous fairy workshop which attracted 14 but that did feel almost too crowded.As usual everyone made a different looking fairy. Each individual put their own stamp on their creation. This week I was reminded of the inspectors that come round shops looking for breaches of copyright. Knitting companies are trying to stamp out the practice of people selling anything made from a knitting pattern. I think it is an impossible task. Apparently the same company that checks shops have paid for a licence before playing any music or having the radio on is also looking out for knitted goods. I wonder if they'll patrol craft fairs as well? Knitting is a slow, laborious process. Very few people can make up any one pattern more than once or twice.I could understand knitting pattern designers anxiety if someone was reproducing their work in a factory and making hundreds of items. But to target (and fine) shops for selling individual hand knitted items seems like overkill. Personally I would like to have background music playing in my shop. But I'm not paying £200 plus annually for that luxury so apologies that it's always quiet in Handmade Happiness - unless you happen to come in when I'm singing. Nobody can fine me for singing - however much they may want to!!! Thank you to Carol Smith for taking these photos of some of the fairies people made at the workshop last night. Next week we'll be making Christmas decorations. Photos coming soon.